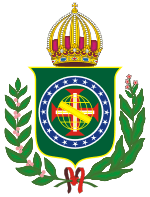 Original coat of arms of the Imperial House of Brazil, before 1912, when was added the coat of arms of the House of Orléans in the middle of the Imperial blason (23 years after the Brazilian proclamation of the republic). 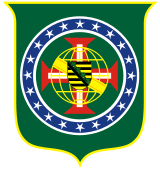 On September 7, 1822, Dom Pedro of Braganza, Prince Royal of Portugal, Brazil and the Algarves, member of the House of Braganza, heir apparent to the Portuguese throne and the King's representative in Brazil, declared the country's independence from the United Kingdom of Portugal, Brazil and the Algarves and proclaimed himself Emperor of Brazil. The imperial title was officially bestowed upon him on October 12, 1822. This resulted in the Brazilian Declaration of Independence. In 1825, signing the treaty of Rio de Janeiro of this date, his father, King Dom João VI, recognized the independence of the new state, the former Portuguese dominion, now Empire of Brazil. 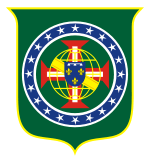 Brazil, from 1530 to 1815 a colony of the Portuguese Empire, had been officially elevated to the status of United Kingdom (with Portugal) in 1815, in the reign of Queen Maria I of Portugal, by the Prince Regent Dom João of Braganza (future John VI). Between 1815 and 1822, the kingdom was known officially as the United Kingdom of Portugal, Brazil and the Algarves. Dom Pedro I of Brazil (1822–1831): Born in 1798, deceased in 1834. Was also King of Portugal in 1826, as Pedro IV. Dom Pedro II of Brazil (Regency 1831–1840; Reigned personally 1840–1889): Born in 1825 and deceased in 1891. Dona Isabel of Brazil (1891–1921): Born in 1846, died in 1921. Princess Imperial and former Regent of Brazil, she was the elder daughter of Dom Pedro II; her husband, Gaston of Orléans, Count d'Eu, was considered, after the death of Dom Pedro II, the de jure "emperor-consort". Prince Dom Pedro Henrique of Orléans-Braganza (1921–1981): Born in 1909, died in 1981. Grandson of Dona Isabel, son and heir of her second son, Prince Dom Luiz of Orléans-Braganza (1878-1920). Prince Dom Pedro Gastão of Orléans-Braganza (1940–2007): Born in 1913, son of Dona Isabel's eldest son, who had renounced all rights to the Brazilian throne for himself and his descendants. The validity of the renunciation was disputed by Dom Pedro Gastão. Prince Dom Pedro Carlos of Orléans-Braganza (2007 – present): eldest son of Dom Pedro Gastão. He doesn't put in question the validity of the renunciation. Contrariwise, he declared himself a republican. Arms of the House of Orléans-Braganza. Arms of the Saxe-Coburg and Braganza branch. ↑ Bodstein, Astrid (2006). 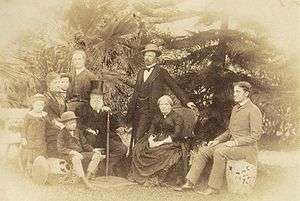 "The Imperial Family of Brazil". Royalty Digest Quarterly (3).